اشتری تلخستانی, احمد, نبی بیدهندی, مجید, جمالی, جواد. (769). برآورد توزیع تخلخل مخزن از نشانگر‌های لرزه‌ای با استفاده از مدل عصبی- فازی NEFPROX در دشت گرگان. مجله ژئوفیزیک ایران, 5(1), 1-15. احمد اشتری تلخستانی; مجید نبی بیدهندی; جواد جمالی. "برآورد توزیع تخلخل مخزن از نشانگر‌های لرزه‌ای با استفاده از مدل عصبی- فازی NEFPROX در دشت گرگان". مجله ژئوفیزیک ایران, 5, 1, 769, 1-15. اشتری تلخستانی, احمد, نبی بیدهندی, مجید, جمالی, جواد. (769). 'برآورد توزیع تخلخل مخزن از نشانگر‌های لرزه‌ای با استفاده از مدل عصبی- فازی NEFPROX در دشت گرگان', مجله ژئوفیزیک ایران, 5(1), pp. 1-15. اشتری تلخستانی, احمد, نبی بیدهندی, مجید, جمالی, جواد. برآورد توزیع تخلخل مخزن از نشانگر‌های لرزه‌ای با استفاده از مدل عصبی- فازی NEFPROX در دشت گرگان. 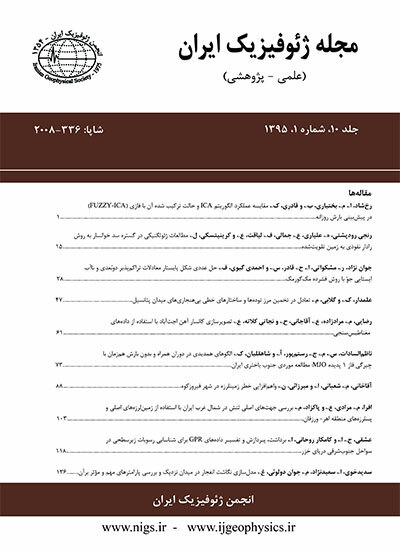 مجله ژئوفیزیک ایران, 769; 5(1): 1-15. برآورد توزیع تخلخل مخزن در فواصل بین چاه‌ها در تعیین دقیق گسترش جانبی مخزن و در نتیجه در برآورد میزان ذخیره هیدروکربوری و برنامه‌ریزی برای بهره‌برداری از مخزن، از اهمیت اساسی برخوردار است. یکی از دقیق‌ترین روش‌هایی که تاکنون برای این منظور به‌کار رفته، استفاده از برآوردگر غیرخطی مانند شبکه عصبی و مدل‌های عصبی- فازی برای برآورد پارامتر پیش‌گفته از نشانگرهای لرزه‌‌ای است. شبکه‌های عصبی و مدل‌های عصبی- فازی هر دو برآورد‌گرهای غیرخطی خوبی هستند، اما مدل‌های عصبی- فازی یک مزیت نسبت به شبکه‌های عصبی دارند و آن تفسیر‌پذیری مدل عصبی- فازی است. در این تحقیق از مدل عصبی- فازی NEFPROX برای برآورد تخلخل در یک مخزن گازی در دشت گرگان استفاده شده است. با توجه به مقاطع تخلخل به‌دست آمده، دو کانال ماسه‌ای و ماسه‌ای- رُسی با تخلخل نسبتاً کم در واحد زمین‌‌شناسی Brown Beds به وضوح قابل تشخیص است و تغییرات جانبی آنها را در این مقاطع می‌توان دنبال کرد. مغزه‌های حاوی هیدروکربن که از چاه GO3 گرفته شده‌اند، وجود دو کانال پیش‌گفته را تأیید می‌‌کنند. نتایج برآورد تخلخل با این مدل‌ عصبی- فازی نشان می‌دهد که دقت آن تقریباً برابر دقت شبکه عصبی MLP برای برآورد تخلخل است ولی از دقت شبکه عصبی RBF برای برآورد تخلخل بیشتر است. Prediction of spatial distribution of porosity in a reservoir is an essential issue for estimating reserves and planning production operations. In most cases, however, lateral variations of porosity cannot be delineated from measurements made at sparsely located wells. The integration of 3D seismic data with petrophysical measurements can significantly improve the spatial description of porosity. In the last two decades, several methods have been developed for the estimation of reservoir porosity. A number of inversion methods are available in the industry to convert seismic amplitude into acoustic impedance. Acoustic impedance is indirectly related to porosity. Alternate integrative approaches for estimating porosity include geo-statistical methods, such as kriging and co-kriging using well and seismic data. One of the most accurate methods for estimating reservoir parameters is the application of seismic attributes by a nonlinear estimator, such as neural network or neuro-fuzzy model. Both neural networks and neuro-fuzzy models can be good estimators but the latter has the benefit of being interpretable. In this study, a neuro-fuzzy model called NEFPROX was used to estimate porosity in a gas reservoir located in the Gorgan Basin. NEFPROX is a Mamdani-type neuro-fuzzy model, so it has an advantage of being interpretable that makes it distinct from other type of neuro-fuzzy models. The time-consuming characteristic of that method is irrelevant in this case because the prediction of porosity is an offline prediction problem. The Gorgan Basin is located in the northern part of Iran, southeast of the Caspian Sea. This area consists mainly of three formations:the upper formation, called Clay-Sand Group I, belongs to quaternary period. Below Clay-Sand Group I is a tertiary formation called Clay-Sand Group II. A formation of Brown Beds is also a tertiary formation that lies below Clay-Sand Group II. All of these formations consist mainly of shale and sand. The discovery of gas in the Brown Beds Formation has persuaded explorationists to increase their activities in the Gorgan Basin. The purpose of this study is to recognize shale and sand bodies in the Brown Beds formation that consists of alternative sand and shale layers with variable thickness. First, a list of 20 seismic attributes was prepared to extract from raw seismic data in the location of wells. Stepwise regression was used to select four appropriate attributes. The maximum number of attributes was set at four to avoid the model complexity. These attributes, in the order of priority, are instantaneous frequency, amplitude weighted frequency, apparent polarity, and second derivative instantaneous amplitude. Then these four selected attributes were introduced into the neuro-fuzzy model as input to predict porosity as an output of the model. The neuro-fuzzy model was trained with the data of well GO3. Based on hydrocarbon core samples obtained from the Brown Beds formation and the potential of this formation as a probable reservoir, the data corresponding to this formation were selected as a training data. A model blind test was also conducted with the data of well GO5. Porosity sections generated as the output of the model showed two low porosity sandy and shaly-sand channels in the Brown Beds formation. Lateral variations of these channels can clearly be recognized in these sections. The core samples available in well GO3 (containing hydrocarbon) confirm the existence of the two inferred channels. This clear image of channels is simply unidentifiable from raw seismic data. Hence, NEFPROX can be very helpful in supplying valuable information about extent, shape and lithological variation of a reservoir. Finally, compared comparison was made between the performance of the neuro-fuzzy model and regular neural networks in estimation of porosity. The comparison indicates that the accuracy of the NEFPROX estimation is equal to that of MLP and is greater than that of RBF.